On this site stood the house that was once the Elizabeth Davis Children's Home. The Greek Revival -- style house was built circa 1855 for Oshkosh attorney Coles Bashford (1816-1878). Bashford was later elected Wisconsin's first Republican governor and served 1856-1858. The house was purchased in 1875 by Oshkosh lumberman Robert McMillan (1830-1897), whose family owned it for more than 30 years. In 1911, the house became the property of trustees authorized by the will of Elizabeth Batchelder Davis (est. 1822-1910), whose dream was to provide and perpetually maintain a home for children needing care and shelter. 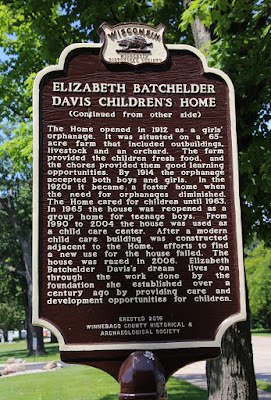 It was then known as the Elizabeth Batchelder Davis Children's Home. The Home opened in 1912 as a girls' orphanage. It was situated on a 65-acre farm that included outbuildings, livestock and an orchard. The farm provided the children fresh food, and the chores provided them good learning opportunities. By 1919 the orphanage accepted both boys and girls. In the 1920s it became a foster home when the need for orphanages diminished. The Home cared for children until 1963. In 1965 the house was reopened as a group home for teenage boys. From 1990 to 2004 the house was used as a child care center. After a modern child care building was constructed adjacent to the Home, efforts to find a new use for the house failed. The house was razed in 2006. Elizabeth Batchelder Davis's dream lives on through the work done by the foundation she established over a century ago by providing care and development opportunities for children. The marker is next to the parking lot for the current Davis Child Care Center, 1260 North Westfield Street, at its intersection with Oshkosh Avenue / Wisconsin Highway 21, Oshkosh, Wisconsin 54902. This marker replaces Marker 217: Coles Bashford House, which became obsolete and was removed. Looking east along Oshkosh Avenue. Looking west along Oshkosh Avenue. Looking southwest, where the house once stood. View of the new facility from the marker location. Good question, Jason! The marker probably already has a number. It's just that the Wisconsin Historical Society (1) doesn't announce its new markers and (2) doesn't keep its "official" list up to date for the public. Kinda frustrating!